On eBay I recently purchased a set of cute small USB AVR programmers which I intend to use in the course 1TE663 Microcontroller Programming at Uppsala University. MK-USBISP-V3.00 programmer in an aluminum shell on eBay. After waiting for one month for the delivery from China the package finally arrived today. 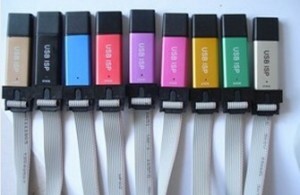 Unlike other programmers which I purchased before, these come with a sturdy aluminum shell and in happy colors. At that time I got a bit confused, because the programmer registered as an HID unit on the USB with vid=0x03EB & pid=0xc8b4. Not as an USBasp with vid=0x16c0 & pid=0x05dc. This is the point where I usually ask Google. So I did and I found some threads discussing the same issue and pointing out, that these programmers needed a different software and were not at all compatible with avrdude. BAD! But of course, one should be able to reprogram the programmer using another programmer. At my home this is not a henn and egg problem, since I have accumulated several AVR programmers. 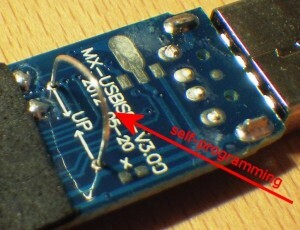 Self-programming jumper on the MK-USBISP-V3.00 AVR programmer. Since the original firmware is protected by the lock-bit fuses, I had to fully erase the chip first, then set the fuses correctly to HFUSE=0xc9 LFUSE=0xef and then flash the .hex file. I tried first the 2009-firmware from Thomas Fischl and the first observation was that instead of the red LED which was on previously, now the programmer showed a blue light. 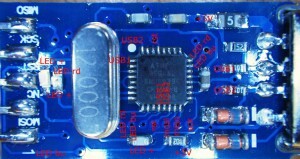 AVR programmer MK-USBISP-V3.00: component side. 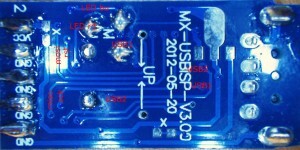 AVR programmer MK-USBISP-V3.00: solder side. hey – wait a second? All pins of port D are defined as output, except for PD2/INT0? I always tell my students to only define pins as output, which are really used as output… And what happens here? Since the modified design also connected USB-D- to PD3/INT1, the rather aggressive definition of output pins leads to a unsolvable conflict, when suddenly PD2 is driving against the USB signals from the host! I will contact Thomas Fischl and tell him about this observation – perhaps the modification will be implemented in the distributed firmware on his homepage. Here is a .zip-archive of the modified firmware. The .hex file for use with an ATmega8 is found in the default subdirectory. Thanks for this info. I think I got one of these, but do you have to remove the case to reprogram it, and if so, how do you remove the case? you put it with the USB-connector down vertically on the table and push the outer shell down towards the table. I have an USBISP too. It’s a MX-USBISP-V3.02 board (2014-10-08) with mega8 on it. I have read a lot, but now I’m totally confused what to do. When I’m trying to reprogram it with the firmware above, I get a first verify error on Adr. 0x0000. Reading the fuses give: Low 0xFF, High 0xDF and Lockbits 0x3F (AVRDudess with USBasp programmer). I guess the Lockbits are the problem, but how to solve it? Changing the Fuses in AVRDudess didn’t work. Can you help me to make the *isp to an *asp? What programmer and program do you use to program the programmer? Have you tried setting the transfer speed to a lower value (-B parameter in avrdude)? I have used an usbasp-stick (fischl-clone) to program the cn-stick. BitClock was set to 8k and 1kHz – no change. I bought an programmer with circuit description MX-USBISP-V3.02 201-10-08 with an atmega88. It uses PID c8b4 and VID 03eb (c8b4:03eb) but i cant get it working. With your HEX i got it, many thanks, now its a USBasp! could you please show me how to modify the source code and how to compile that? maybe tutorial video or else..
Hi, could you show me the video tutorial to compile the main.c ? with the .hex file available you do not need to compile anything. Otherwise: if you are using AVR-Studio you could create a new project with AVR-Studio, copy all necessary files (.c, .h, .asm, .inc, .S and the usbdrv directory) from my zip-archive into that project folder, add the files to the project and “build” it. I have the exactly same problem for 2 days, and after reading this post relaxes me. Please help me how can i program my programmer using another programmer?? how can I help you – the procedure is described above: you need a working, other programmer and then you connect this one to MOSI, MISO, SCK, RESET, GND and VTG of the programmer you want to program. Additionally you have to set the jumper wire to connect the RESET signal to the AVR chip on the programmer. OK i got it. I need a USBasp to convert it into USBasp? I am a beginner, so one silly question. Should i connect the MOSI pin of programmer to the MOSI pin of AVR or MISO pin of AVR? and very thanks for the reply. Thank you very much! I flashed a MX-USBISP-v3.02 into a normal usbasp. I tought I wasted $3 on a broken programmer, but I flashed it using your instructions, and now it works flawlessly. I have never been using the Khazama software – the error message appears to point to a problem with the Windows driver libusb0-dll for the USB device. Please at least try to use avrdude from the command line to perhaps get a more detailed error message. If you like a graphical user interface instead of a command line, consider AVRdudess. You need to use the -B setting which you don’t know! It determines the clock rate at which the bits are sent from the programmer to the AVR you want to program. From your screen-shots you can see that it tries to burn the AVR at an SCK clock rate of 1500000 Hz or 1.5 MHz. According to the datasheet of an AVR, the SCK clock rate has to be less than 1/4 of the AVR’s own clock speed. If you have a brand new AVR than the clock speed is 1 MHz from the internal oscillator and this limits the useable SCK clock rate to 250 kHz. See the documentation of avrdude and use the option -B 5 as a starting point. In avrdudess which I recommended above you can select a suitable SCK clock rate from a pull-down menu. The -b option is not relevant here, since we are not using a serial port to talk to the programmer itself. I tried that firmware and it works, I can use it with avrdude but LED is off, it is always off. This is the last part that should be addressed. It is possible that PD5/PD6 are used as a key to code PCB version or something like that. My PCB is MX-USBISP-V3.02, 2014-10-08, MCU is ATmega88. I bought new version, which uses ATmega88. How can I compile the firmware for this processor? the complicated answer: how do you compile your AVR code normally? If you use AVR Studio then you create a new project, select the ATmega88, copy the complete source code into this project and compile. If you compile using a MAKE file then you create a MAKE file where you set the correct controller. Dear uwezi: Thanks for the great instructions. I uploaded your firmware to a programmer that I got from DealExtreme (DealExtreme part number 151604), and the device now works perfectly as a usbasp. My device is almost identical to the one pictured above. The only difference that I can find is that the date silkscreened on my device is “2013-03-05”, and the silkscreened text is in a different place on the board. I have 5pcs V3.02 and check again. I put new Atmega8 from shop and now I can read signature and program uC. In new version V3.02 pin reset is disabled. This is problem because I don’t have HV programmer. are you sure that it was the “reset disable” which was the problem and not a “lock fuse” which can be reset using a complete chip erase cycle? I was able to re-program v3.02 boards without needing to get out the chip and use high-voltage programming. Now the nice programmer works like a charm! you saved my day, thank you very much, I had this piece of device for some time and today took the time to hack it as you suggested. I think you can let them as original, and avoid the tricky touch fuse part than can sometime brick the device (in case of problem) so my 2cent advice is not touching the fuses, they worked before they should work after, it’s the same device. I also have buy one o this USBISP, mainly for the nice aluminium case. After a couple of tryes to make’it work like a USBASP whithout hardware modification I have concluded that best wai is to make’it USBASP hardware compliant. Mine was having botd PD3 and PD2 directply connected to USB port D- and D+ and the LED’s were in antiparalel between PD5 and PD6. So I cut the trace on PD32, PD3, PD5, PD6 and between LED’s at one end. After that I put 2 68ohm resistor on the zenner diodes and rewire from them to PB0 for D- and PD2 & PB1 for D+. The common of the LED’s I connected to +5V thru a 1K resistor, I desolder one led and put’it same as the other one (anode to common +5V) and the cathodes I connected to PC0 and PC1. You can also put different collors. To program I use Another USBASP and a wire jumper for Reset. Result: one nice piece of fully compatible USBASP. …but if it works for you – the better. I’m using an arduino uno as isp (the -c arduino is for programming the arduino itself). I already double checked the connections and tested the arduino with another chip (and it works), however i keep getting that error about the device signature. i’ve been googling about it, but i can’t really figure it out. What programmer are you using now? setting to override all warnings? According to the messagens from avrdude from when i try to erase the chip, the task was completed. wich is not the correct fuses. Actually, when i try to set the fuses, the red led on the usb programer is turned off, but i don’t know if this matters. I think i’m messing up the post with these long replys. I’m sorry. I have the hw v3.02 and I cannot update the firmware. I’m using an original AVR ISP mkII with AVR Studio. I connected everything, even tried to switch MISO with MOSI, but there is no reply from the chinese microcontroller. The reset signal is correct and the jumper is inserted. Same problem here. MX USBISP v3.02 (bought mid december), unable to program or erase with avrdude. While attempting to program, there’s no response on MOSI whatsoever, even though all other signals look just fine. A new update on the matter! Recently quite a few eBay-stores have started selling a new version of the programmer in the same aluminum case. These programmers have the printing “Atmel” on the front together with a printing of the connections on the 10-pin programming header. These programmers do not need to be reprogrammed, but already contain the correct Fischl-compatible firmware and not the weird and crappy Chinese software. I just noticed that the firmware in these new-type USB programmers is not the latest version of the Fischl-firmware. It does not allow avrdude to set the clock speed on the programming port. However, the circuit board inside the new-type programmer is exactly the same as shown above and readily accepts the firmware version which you can download from the link above. In order to program the programmer you will again need another programmer and additionally you bridge the two pads marked “–>UP<--". Hi. I have this avr programer with new PCB ver. 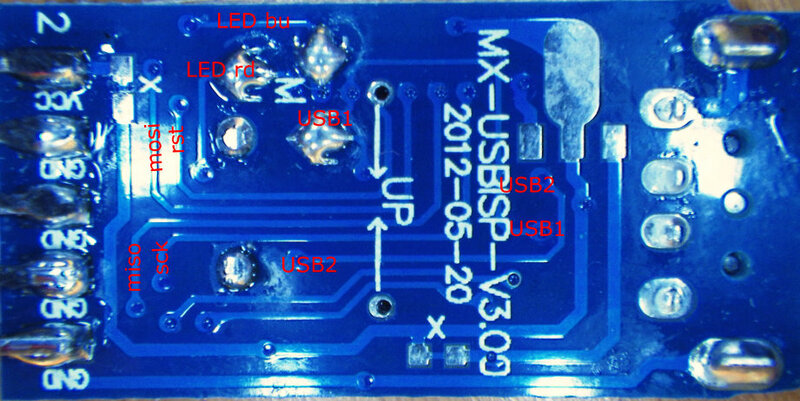 MX USB V3.02 and one old AVR with V3.00 PCB. When I connect old vesion to other programer I have connection and can read signature and write new firmware. With new PCB 3.02 I can’t connect with atmega. Only RC-1. PIN reset on old pcb have about 0V when I connect -UP-. On new PCB V3.02 olways have 3,6V on PIN RESET. On new PCB atmega8 is closed for LOCK FUSE or have change RST PIN for other function? Any idea ? I have the same problem. The Version is V3.02 Date 2014-10-08. You can`t change the firmeware. I use PROGISP 1.72 from http://www.zhifengsoft.com. I Think, the RESET-Pin is disabled. I tested Version V3.00 2013-03-15. Here you can change the firmeware without any problems. The pcb-layout is nearly the same, only two brighes are different. The atmega8 are the same. I killed the brighes – no effect. This is made in china-rubbish! Hi Paul, what error message do you get, when you connect the new programmer? In case (a) the problem is that your programmer is trying to talk too fast to the target AVR chip. This can because the firmware in the programmer either is not able to set a different speed, or because you did not choose a slower speed from the avrdude options. In case (b) you don’t have an avrdude-compatible firmware in the programmer. What do you mean with “RC-1”??? The reset-pin should only have 0V when it is connected through the -UP- bridge AND you are trying to program it from another programmer AND only during the short programming attempt – I would not expect you to see this with a regular multimeter. If the LOCK FUSE is set on the Atmega you can still erase the complete chip including the LOCK FUSE and then re-program it with a new firmware. Only if the manufacturer has disabled the reset pin with the corresponding fuse you would not be able to reprogram the chip using the ISP-interface at all. But I have not seen this yet – neither on 3.00 or 3.02 programmers – both of which I have by now bought from different European and Asian sources. (I have some throughput here, because I needed to get more programmers for my students nd by now I also had to replace 2 broken programmers). I feel I should warn you: my programmer came with the “Atmel” logo and pinout printed on the case, and it still had the Chinese USBISP firmware. So I fear that this case isn’t a guarantee that you will receive it with USBasp. I have to admit, though, I never tested mine (v3.01 board) with the unmodified USBasp firmware. I went straight to using yours. The problem would not be to translate it to Bascom, but that the code size exceeds the flash memory size of your ATmega48! You can (and in my opinion should) program the ATmega48 in C the same way you can program any other ATmega or ATtiny in C. Trying to do the same in Bascom will most certainly not make the code smaller. The older – but still fully compatible – 2009-version of the Fischl AVRUSB firmaware still fits in a ATmega48. You can find it here: http://www.fischl.de/usbasp/ and the zip-file even contains a pre-compiled .hex-file for the ATmega48. Hello, I have MX-USBISP-V3.01 and It works well by using your firmware. However I get an error when I tried to write hex file to Attiny10 by TPI. When I watched at Thomas Fischl ‘s web site, and found that usbasp.2011-05-28.tar.gz supports TPI. I think that the failure due to the version of the firmware. So, I tried to make hex file using AVRstudio6.2, but I have failed because I do not know the way. Please tell me the way of making firmware, or make a firmware using the latest source files? Moments ago , I tried WINAVR. As a result , I was able to create the latest firmware that corresponds to the MK-USBISP. No led is lighting after the process and wwen I plug it into USB It shows as “Unknown USB Device (Device Descriptor Request Failed)”. You can find the documentation for avrdude here. In order to give a value for a fuse on the command line you need to terminate the -U with :m, otherwise avrdude is looking for an external file – this is what avrdude tries to tell you with avrdude: reading input file “0xc9″. Once avrdude discovers a problem in the command line it will never do anything, but completely abort the operation before any harm could have been done! Sorry for the long reply. Also, sorry if I’m not making much sense. Microcontrollers are quite new to me. you of course need to replace “myport” with the actual portdescription on your system. Also if you are using the Arduino as a programmer you first need to load a corresponding sketch into the Arduino. What disturbs me a bit is that you get messages about the STK500-programmer back… even if I have nothing connected to my computer, I get a more helpful feedback from avrdude using the exact same command. That worked like a charm. I successfully uploaded a test sketch using the programmer. Thanks a lot for your help and for the beautifully detailed article. Seemed to work fine. I’ve got the blue light. BUT the hardware information panel of my Mac says that the device is not configured, even though it is recognized by my Mac as a USBasp. Great !! Thanks to all! Thank you so much for this article. My board is marked v3.01, dated 2013-11-07. I have reprogrammed it with your modified firmware, and it seems to be working fine. I also have this useless programmer and I’d like to reflash it using the modified software. But could you please provide me with any way of how I’m suppose to connect my external usbasp programmer to program atmega8 on this usbisp programmer board. Should I connect directly to the pins on smd chip or some other way? I really wouldn’t call these programmers useless. They have a comparatively high quality. You program the programmer by connecting another programmer 1:1. MISO-MISO, MOSI-MOSI, SCK-SCK, RESET-RESET, GND-GND and VTG-VTG. Additionally you need to short the on-board jumper as described above. So I should connect my external programmer to ISP socket of the programmer I’m programming and short circuit rst pin on the board? Yes, you connect the two programmers with a standard 10-pin cable and set the jumper on the programmer which needs to be programmed. Only the programming programmer should be attached to the USB port of zour computer at that time. Just see the programmer as an AVR target system, which you want to program. Oh I see. I just thought that MISO,MOSI,VCC,SCK,RST in ISP socket of the programmer which I/We want get reprogrammed are not connected with pinouts marked on the above pictures. So what I did was interface with those tiny holes but it worked. Anyway. As you said it. I could connect the two programmers with standard 10 pin ISP interface without the need of trying to put wires through those small holes. Thanks. I think that there are others who also didn’t know that. 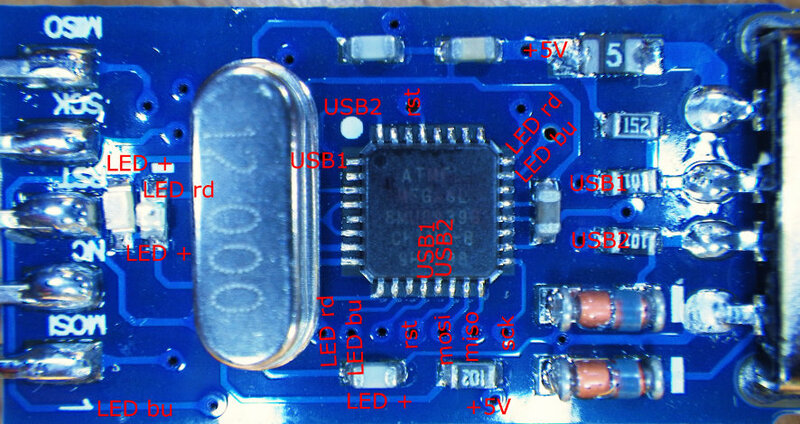 USB-10pinISP ==10pinISPcable== 10piISPsocket + short circuit RST on the board. You can find the schematics of the USBasp programmer on Thomas Fischl’s homepage. There you can see the connections in detail. When programming an AVR chip with the programmer, the programmer takes the role of Master and the target becomes the Slave, thus MOSI goes from the programmer to the external AVR chip. When programming the programmer, the other programmer becomes the Master, and thus MOSI goes from the other programmer to the one you want to program. This way you can understand that the wires can be connected 1:1 with the exception of the Reset-line. The latter is because the programming (Master) AVR chip cannot control its own Reset pin and at the same time remain ISP-programmable. Anyone here to guide me about what i am doing wrong, or atlest put me on the right path…. “you have tried to install the drivers” – well that is not enough, you will have to successfully install the drivers before Windows (I assume you use Windows..) will recognize the USBasp! You write about drivers in a RAR file – well the original drivers come in a ZIP file from the address http://www.fischl.de/usbasp/. In this you will find Windows executable installers for both 32- and 64-bit versions of Windows which you will have to run with administrative rights. comparing two schema show that the blob of solder onto ‘B’ should be removed and PD2 should be connected to PB1. what is your idea mr.menzer? Gawsh dern it….I wish I knew WTH you all are saying. I’ve just jumped into the MC thing and have a programmer on the way but, looks like I still wont be able to begin any fun because the programmer may not work with my diyduino according to what I’m reading here…but I dont know what- I dont know yet and the language used for these fixes is beyond me. anyone speak layman want to toss a few definitions out for a new-newbie? Most of the USB AVR programmers out there are compatible with avrdude, the commandline tool you most probably want to use to flash your AVR controller. For these compatible ones you will probably need to install a driver under Windows, while this is not necessary if you are running Linux or MacOS. However, a very nice looking USB AVR programmer, which comes in a rugged aluminum casing. These programmers do not need a separate driver under Windows, but they cannot be used from the popular avrdude. Instead these rely on a proprietary Windows software with possibly no future updates and poor support and documentation. I am a victim of .bay too ………..not an usbasp at all . Have you made a firmware based on thomas fischl’s firmware dated 2011-5-28 ?? Will that be possible ?? my Board is dated 2013-03-15.what do you mean “connect jumper ‘B’ to D-“?i mean short circuit 100ohm on dminus.is that true? if yes it is forever or just for self prodramming? I did not use any resistor, just a blob of solder onto ‘B’, that’s it. can you upload your hex file please? which is SUITABLE for my board? The zip-file is not mine it’s just linked here. I also only have the 2012-05-20 boards as shown here, but I am not aware of any changes in the layout, user Menzer only commented that there was a different board date code out there, but not what the difference was. Since the zip-file is his, and he has the same board, then both of his versions should work for you. I have the same board as you. Flashing the hex from uwezi does provide me with a “usbasp fischl” programmer, but it does not work as expected. Any chane you can post your hex file somehwere so that I can try an flash it? I am new to all this microcontroller programming and still struggling in how to build my own hex file with the mods from shay. I assume that it should be as easily possible to modify the 2011-05-28 version of the firmware. I just had a look at the source code of the 2011-05-28 version. The definition of port D is found in main.c line 306-310. It is the exact same code as in the previous code version, however, I do not know if there are any other conflicting definitions in other parts of the code. Oh god yes. Why do people make everything an output? It’s just begging for some unexpected connection or extra hardware causing a short and damaging the part. In all my AVR code the very first step in main() is to make everything inputs and enable pull-ups. No floating pins (so no excessive CMOS current draw), no high current draw if something is connected to an input, and no floating inputs to any pins used as outputs to something else. Then modules can make only those pins outputs that are actually outputting something. It’s surprising since the rest of the code is of a general high quality, with good modularity and no excessively-long source files. Except that all the devices currently using the output-by-default code have the potential to be depending on this. e.g. the TX and RX pins are connected to the ICSP on some designs, and will thus be 0V with some decent current sink capability (less for TX since it has a 1K series). At this point it’s probably more risky to fix this than change it. Perhaps it could be a settable option that defaults to the old behavior, so in new designs it can be enabled and tested for specific hardware. which I didn’t see mentioned in your post. I put a link to my code changes in the website link of this message. Programmer works perfectly with AVRDude and Eclipse.Big Thanks. Just wanted to say: Thanks a lot! Otherwise, I would have a useless usb programmer. Life saver. Thanks for your hack. Hello, i want to asking something..
whether this tool could be used for a minimum atmega AT89S52? I always find error..
Have a look at the AVR freaks forum. There user newbie123 posted the necessary modifications for the configuration file of avrdude on Oct 18, 2010. Thanks for the comment – but this is only relevant for someone who wants to use an Arduino to re-flash this programmer. Used KKmulticopter flashtool and a Baite USBASP programmer to put your firmware on a MX-USBisp-V3.00. Works on first attempt! I bought the same isp and felt into the same troubles. Many Thanks for your tutorial, now I could make it works ! everytime I tried to upload using Arduino IDE. (My other USBasp worked fine.) Please, help! This is normal – it is normally the symptom if your programmer tries to send data too fast into the AVR. Your other USBasp might have the external jumper which slows down the transfer rate. This newer firmware version supports a software command to slow down the transfer rate. In the command line options of avrdude please try to use the additional option -B 10 (that’s a CAPITAL B). If this works you can subsequently try to use lower numbers (the higher the number the lower the speed). When I ran the command below, it seemed to work correctly. Arduino IDE uses avrdude to upload sketches. I tried to google for how to configure Arduino IDE to pass the option -B 10 to avrdude. However, the only available option related to speed is “.upload.speed=” which specifies the baudrate. Any chances, you can show me how to set Arduino IDE to pass the B-flag to avrdude? Sorry, but I do not use Arduino or the Arduino IDE. But on the other hand, the “-B” option also just sets the “upload speed”. Possibly the Arduino IDE option does a similar thing – on the other hand it also possibly just sets the baudrate for serial-port programmers… You should ask this question in an Arduino forum! I would guess that the option somehow can be set using the hidden preferences.txt file of the Arduino IDE, but it seems to be poorly documented and this is one reason why I never even considered using Arduino. Programming the same microcontrollers using GCC directly you are not bound by an obscure intermediate layer of software. The SCK speed needs to be slower than 1/4 of the AVR’s current clock speed. This means for a brand new Atmega328 with a preset clock frequency of 1 MHz you need to use “-B 3” or higher. A proper explanation of the preferences.txt files. Thank you a lot for taking your time to help me out. I have found out how to fix it. I just leave the link below in case someone also has the same problem. I agree that with your point about arduino and I do feel restricted by arduino platform. I’m looking for books for beginners that teaches about programming AVR MCUs with C/Assembly (using ISP is prefered). I hope you can recommend me some good ones. I’m kinda new about microcontroller knowledge. So, Can I reprogram the firmware without any external programmer? Because you mentioned 'self-programming jumper'. “self programming” may be a bit misguiding and actually leads to a chicken-and-egg problem. You need another working programmer to reprogram the programmer. Look for a programmer which either directly states that it is compatible with avrdude or one which is explicitly called USBasp. If you plan to use it yourself but want to protect it better then you can easily encase it with a strip of heat-shrink tubing to protect it from being short circuited by loose wires from your breadboard or alike. The original firmware (HID) on the aluminum-cased programmer appears to be only supported by the Chinese software which you can download from the seller’s site. This has nothing to do with the driver for the USBasp which you will need additionally anyway. I figured out the external programmer necessity after taking a little walk with Mr.Google and ended up ordering USBasp v2 by LCsoft which has 3.3/5v option (jumper setting). Program the aluminum-cased one first, then you can program the other one. I have done this procedure myself a couple of times now, because most of the USBasp clones from China are shipped with an old Firmware which does not allow the SCK speed setting from avrdude. Don’t give up if you at first get a message about a problem which might be caused by the speed setting – in my experience with the old firmware you will succeed in about every third attempt at the default high SCK speed. Thank you very much for everything!! Because of you, it’s very easy. The hardest part was searching the correct jumper/wire diameter. In the end, I plucked several cores from stranded wires. I also recommend this video for beginner as eepe is very easy if you’re not familiar with avrdude cmd line, http://www.youtube.com/watch?v=iHJwN7Z8QA4. Just plug both end, follow the video instruction, and it’s done. No hassle at all. Actually I normally use AVR Bunr-o-mat – even less command lining, since also the target device type is chosen from a drop-down menu. Works perfectly, thank you for the tutorial! What for M on the board? is this to set the mode? This programmer does not have a hardware jumper. However, the software version which I put on this page but which originally stems from Thomas Fischl supports the -B option of avrdude to specify the ISP speed. Thanks, I had already thrown the programmer in a corner marked as useless. It was quite a bummer when I found out that this programmer didn’t work with avrdude. Thank you very much for the .hex! Works with a device labled MX-USBISP-V3.00 2012-05-20. I found that you can reprogram these with the unmodified fischl.de usbasp.atmega8.2009-02-28.hex or usbasp.atmega8.2011-05-28.hex firmware and they seem to work as far as I can tell. The only change is on the back of the pcb have three solder bridges that need to be removed. These look kind of like a fork shaped solder bridges. Once these are removed then it should show up in Windows as a standard USBasp device, of course with one of the fischl.de images loaded. thanks a lot, I got it working last week compiling it myself. I’d like to try the slow sck of aspusb, and I was wondering if you figured out where the SLOW SCK jumper should go in this “equivalent” programmer. did you also get it working on attiny? According to the verbose output of avrdude, the “-B 10” option results in an SCK frequency of 93750 Hz. I also tested with “-B 5” (187500 Hz), still works – my ATtiny runs on the internal 8 MHz oscillator at full speed. Is your ATtiny possibly set for the internal 128 kHz oscillator? In that case you need to use an SCK frequency below 32kHz, e.g. “-B 30” or higher. know if it still supports the jumper at all). Specify the bit clock period for the JTAG interface or the ISP clock (JTAG ICE only). The value is a floating-point number in microseconds. The default value of the JTAG ICE results in about 1 microsecond bit clock period, suitable for target MCUs running at 4 MHz clock and above. Unlike certain parameters in the STK500, the JTAG ICE resets all its parameters to default values when the programming software signs off from the ICE, so for MCUs running at lower clock speeds, this parameter must be specified on the command-line. It can also be set in the configuration file by using the ’default_bitclock’ keyword. I got the same programmer, could you post the hex file of the final firmware you flashed? I can’t compile the firmware, give me tutorial please. what the compiler are you use.? I am using AVR GCC in WinAVR-20100110. I will upload the .hex file for the ATmega8-version here.